At any point in time, Windows will have a lot of applications connected or trying to connect to the internet. With all those applications, it is only natural that they are using a lot of ports. From time to time, two applications may need the same port to work. When that specific port is in use by another application, it cannot use that port and the application may show a warning message or crash entirely. In those situations, it is better to know which ports are in use and which application is using that specific port. That way, you can either change the port or terminate the problem causing application so that the other one works as it should. 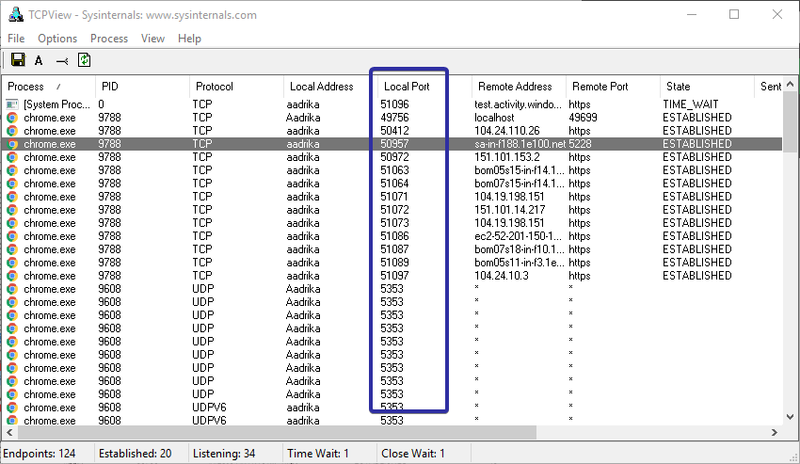 Without further ado, let me show you how to find which ports are in use in Windows 10. Below show methods work in Windows 7 and Windows 8 too. Using a single command, you can get a list of all the ports that are in use by various programs. 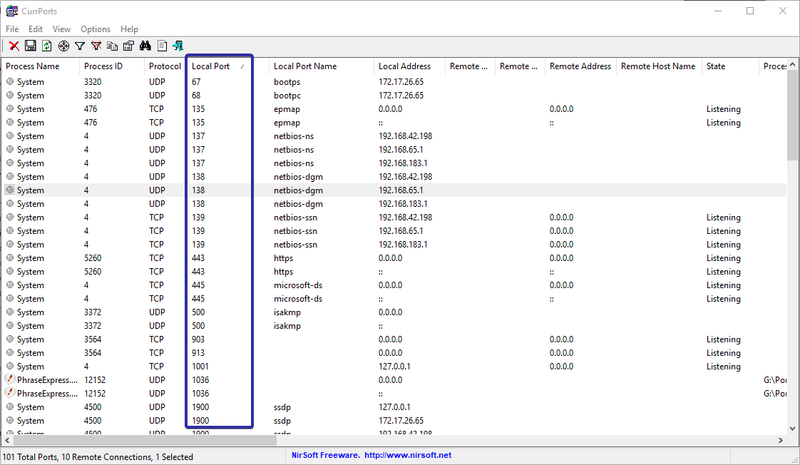 This method is quite useful if you want to take a quick glance at the ports in use. 1. 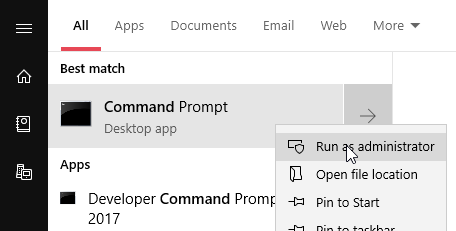 Search for "cmd" in the start menu, right-click on the Command Prompt and select "Run as Administrator". This option lets you open the command prompt with admin rights. 2. In the elevated command prompt window, execute the below command. You can copy the command and paste it in the command prompt window by right-clicking inside it. 3. In the resulting output, you will see the port number right next to the IP address (ex: 192.168.42.198:50943). You can see the highlighted portion in the below image for better representation. Keep in mind that the list will not be refreshed automatically. You have to execute the command again when you need an updated list. If you want the used port list to be updated automatically, use the below two methods. 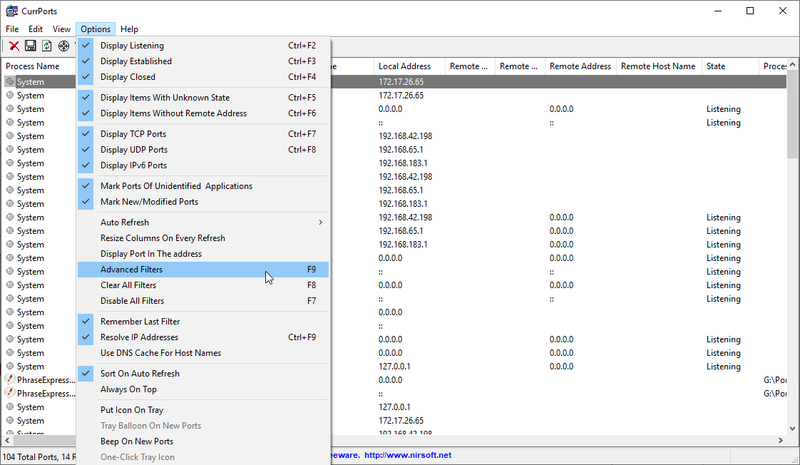 Nirsoft Utilities has a pretty neat and lightweight tool called CurrPorts which lists all the ports that are in use by Windows and other programs. In case you don't, Nirsoft has a lot of small and portable apps that are quite useful in day to day life. If you've never used Nirsoft Utilities, go browse the developer site and you will find interesting little tools. 1. First, download CurrPorts from the official website. Being a portable application, you don't have to install it. After downloading, extract the exe file from the zip file and double-click on it to open. 2. As soon as you open the window, the application will list all the connections and their ports. You can find the port number under the Local Port section. 3. Being a dedicated port monitoring application, it offers quite a few options to manage the applications and ports. 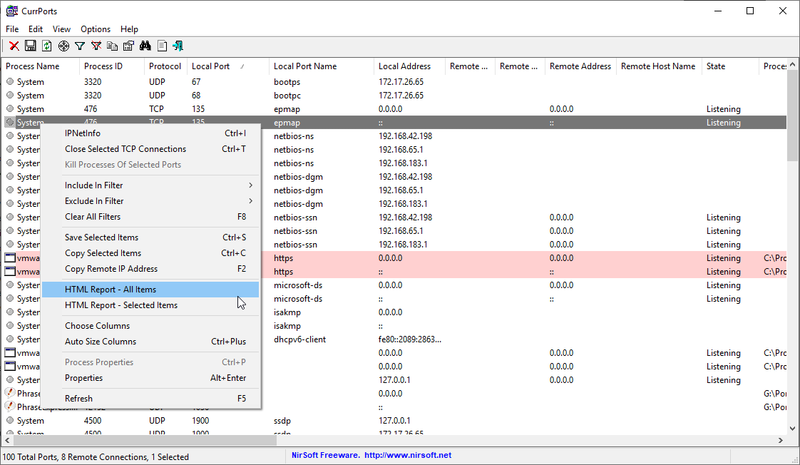 Just right-click on any option and you will see relevant options like the ability to close the TCP connection, copying properties, application properties, etc. 4. If you want finer control, you can create your own filters to narrow down the search. To do that, select "Options -> Advanced Filters" option. 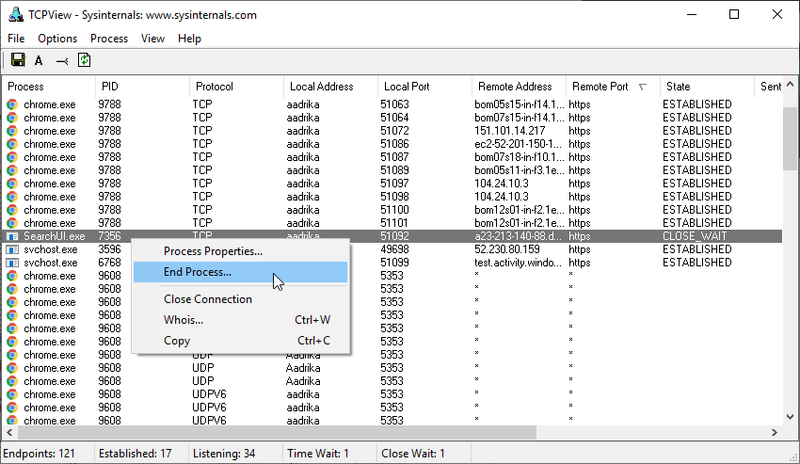 Sysinternals TCPView is a Microsoft tool that makes it easy to view all the TCP connections and ports in use in Windows 10. The tool is very similar to CurrPorts. 1. 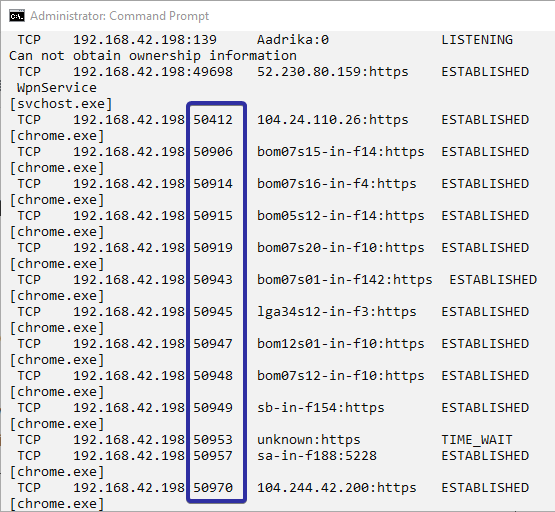 Download TCPView from the Sysinternals website, extract the exe file to your desktop and double-click on it. 2. As soon as you open the application, you will be shown a user agreement. Agree to the agreement and you will instantly see all the TCP connections. You will find the port numbers in the Local Port section. 3. If you want to, you can end the connection and free the port. To do that, right click on the connection and selecting "End Process". This will terminates the process. That is all. It is that simple to find which ports are in use in Windows 10. If you like this article, do check out how to change network name in Windows 10 and how to show download and upload speed on taskbar in Windows.